Android sailors can now explore the online seas for weapons, blueprints, maps, and diamonds to build armed rafts, plunder other ships for loot, and protect themselves against enemy captains bent on snatching their booty. More resources means more dice to roll in battle and better preparation against attacks while the player is offline! See the gameplay in action in the trailer. 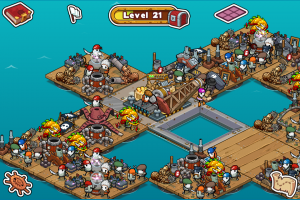 Enter a giant mobile virtual world where real pirates play for keeps! Search for sunken treasure to build the strongest raft with 33 different weapons and nine material types. Gather items to upgrade ships or purchase items in the shop with in-game currencies including diamonds and gold. Fight through five zones with five bosses each. Engage other pirate ships in battle by rolling the dice: the player with the higher dice roll delivers a swashbuckling blow! More weapons provide more dice to roll. The high seas never sleep — a raft is never invincible while a captain is away. Established in 2004, Big Blue Bubble is an award-winning developer of video games. With hit titles such as Burn the Rope and Thumpies, the London, Ontario-based company boasts BAFTA and IGN Editor’s Choice awards. Today, Big Blue Bubble continues to thrive on their guiding principle of designing compelling multi-platform games on mobile, Nintendo DS, Nintendo Wii, PC, Mac, and Facebook.